I’m a little puzzled by my decision earlier his week to put other books aside and jump into Harvey Jackson III’s The Rise and Decline of the Redneck Riviera: An Insider’s History of the Florida-Alabama Coast. I’m sixty pages in so far and enjoying it, but how did I even come upon it? Let’s go back a month. At the time, in anticipation of our upcoming trip to Athens and Augusta, where we would visit the University of Georgia and spend a day at the Masters, I looked around for books on the state and the tournament. This led to James Cobb’s short history, Georgia Odyssey, which I wrote about here and here. And then, instead of a book on the Masters, I read Ron Rapoport’s biography The Immortal Bobby: Bobby Jones and the Golden Age of Golf of one of the Masters co-founders, which I wrote about here. an immensely ambitious and immensely accomplished—and just plain immense—work of narrative art. At a third of a million words sprawled over nearly a thousand pages, “A World on Fire” is not far south of “War and Peace.” Yet the pages fly like the wind—like “Gone with the Wind”—because there’s so much life, so much action, and so many vivid people in them. I don’t entirely disagree. I’m halfway through now, and it is indeed filled with life, action, and vivid people. When I pick it up, I’m fully absorbed. Yet, when I put it down—to sleep, to work, whatever—I don’t find myself missing it. Indeed, while part way through, I squeezed in the reading of another book entirely during our trip: Andrew Delbanco’s College: What it Was, Is, and Should Be (post still to come). I was open to interruptions. Which brings me back to Jim Cobb, author of Georgia Odyssey and a professor at the University of Georgia. He had enough personal asides in his book that I could tell he was a guy worth getting to know better. And guess what? That’s easy to do, thanks to his blog Cobbloviate. He averages about 2-3 posts a month. This opening from a post two months ago gives a sense of the man. The interim between the end of football recruiting and the start of spring practice is a season of unremitting funk for the Ol’ Bloviator. One of the reasons that his funk resulutely refuses to remit is that when nobody’s playing or practicing, he is more prone to move back a step or two and take a harder look at some of the more troubling off-field aspects of this now thoroughly commercialized amateur pastime that, most of the time, despite himself, he loves way too uncritically. For instance, we here at UGA have just seen fit to bestow a modest $400,000 pay increase on head football coach Mark Richt, who had been struggling heretofore to get by on a paltry $2.8 million. Hopefully, Mr. Richt will now feel loved and motivated enough to go out and give our lads another season’s worth of hugs and thwacks on the buttocks sufficient to inspire them to give their all for the old Red and Black. If this is not incentive enough, perhaps an additional $800K in performance bonuses will do the trick. Apparently, we had to give Richt a little boost in pay simply to avoid the mortal embarrassment of having his salary cease to seem less than “competitive” in the Southeastern Conference, where football is not simply the tail that wags the dog but the whole big ol’ dog, who wags his tail and does whatever else he chooses whenever and wherever he by God chooses. 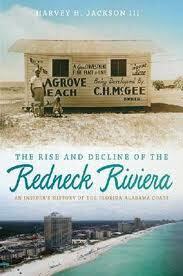 The Rise and Decline of the Redneck Riviera traces the development of the Florida-Alabama coast as a tourist destination from the late 1920s and early 1930s, when it was sparsely populated with “small fishing villages,” through to the tragic and devastating BP/Deepwater Horizon oil spill of 2010. Harvey H. Jackson III focuses on the stretch of coast from Mobile Bay and Gulf Shores, Alabama, east to Panama City, Florida—an area known as the “Redneck Riviera.” Jackson explores the rise of this area as a vacation destination for the lower South’s middle- and working-class families following World War II, the building boom of the 1950s and 1960s, and the emergence of the Spring Break “season.” From the late sixties through 1979, severe hurricanes destroyed many small motels, cafes, bars, and early cottages that gave the small beach towns their essential character. A second building boom ensued in the 1980s dominated by high-rise condominiums and large resort hotels. Jackson traces the tensions surrounding the gentrification of the late 1980s and 1990s and the collapse of the housing market in 2008. While his major focus is on the social, cultural, and economic development, he also documents the environmental and financial impacts of natural disasters and the politics of beach access and dune and sea turtle protection. The Rise and Decline of the Redneck Riviera is the culmination of sixteen years of research drawn from local newspapers, interviews, documentaries, community histories, and several scholarly studies that have addressed parts of this region’s history. From his 1950s-built family vacation cottage in Seagrove Beach, Florida, and on frequent trips to the Alabama coast, Jackson witnessed the changes that have come to the area and has recorded them in a personal, in-depth look at the history and culture of the coast. You can see the focus of the book, from Mobile in the center to Panama City on the right. Lots of inlets, waterways, islands (or one-time islands, now connected to the mainland). Once I finished the excerpt, I returned to Amanda Foreman and the Civil War for a couple of days, but images of Pensacola kept floating into my head. So I downloaded the rest of Redneck Riviera. I’ve gone from Jackson’s rapid treatment of the 1920s and 1930s through the war years, military expansion at Naval Air Station Pensacola and Eglin Air Force Base, and into the 1950s, with World War II veterans making the coast a vacation destination. Growth and development are in the air. It’s all news to me. Not the general arc of the story, but the details, including the geography. I’m learning a lot. Jackson can’t compete with Foreman on life, action, and vivid people. Not to sell him short. He brings plenty of each. And he’s quite a storyteller in his own right. More than that, he’s an awfully companionable fellow. He and Cobb—they’re plain good company. But the development of a stretch of the Gulf Coast in the fifties simply can’t be as exciting as the battles of North and South for the attention of Britain, not to mention the battles of North and South against each other. Nor need it be. Keep in mind that the two tales are linked. The development of the South a century after the Civil War is well worth reading about in parallel with the war story itself. I’m happy with my decision; I’ll keep alternating.